Over this past year, the feedback we’ve received has been very helpful – thank you to everyone to has helped Creative Woodworking grow and learn. The handmade cutting boards – cheese boards, the designs, the wood species, the sizes and the shapes. One thing we realized is that our small board, 7″ x 10″ x 1″ is a bit small. The new small will be square – 10 1/4″ x 10 1/4″ x 1″ – initial thoughts and comments have been favorable. Above is the orginial small size and below is the “new small” – try not to be distracted by the wood tone – isn’t crazy how much prettier cherry becomes as it ages? Same knife, what do you think? Do you think we’ve made the right decision? Guess who we purchase lumber from? 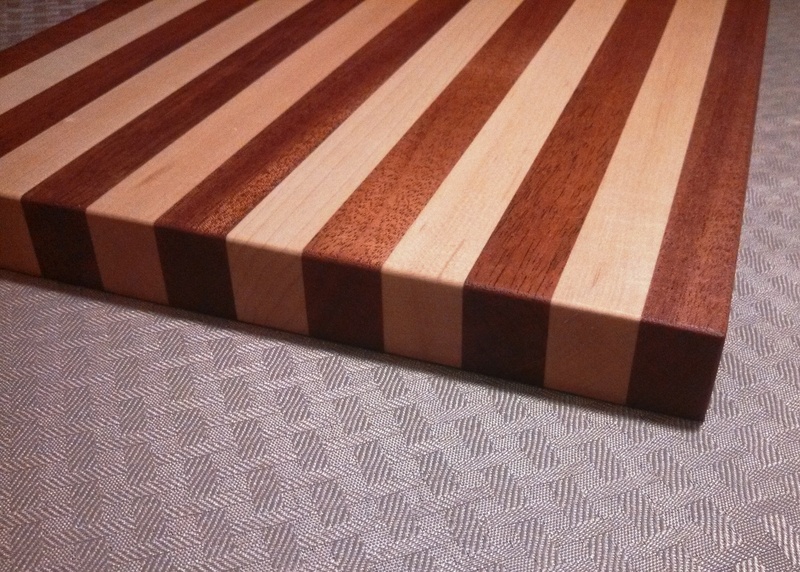 This entry was posted in Artisan Quality, Creative Woodworking and tagged cheese boards, cutting boards, mahogany, maple. Bookmark the permalink. Atlantic Plywood? We agree, the new smaller size offers better proportion for cheese and crackers or maybe a sandwich.